Today’s technology, help the people in a way that they will be relaxed while the machine does the work for us. There are two types of ovens i.e. wolf boosts sleekest and most full-featured ovens which are available in a variety of styles and sizes, Wolf’s high-end ovens can easily integrate into any kitchen. Low energy consumption and easy to maintain. They make all roasting and baking task at a time. The new 762mm series double oven having features that contain all stainless touch control panel, doors, pro-style capped handles. Design meant to coordinate a machine beautifully with similarly-styled Wolf microwaves and warming drawers. In the upper oven, dual convection fans and ten cooking modes control heat and airflow single-convection systems. Uniform heat passing in the oven and circulating air around the food produce faster, more consistent and more predictably delicious results for our baking, roasting and broiling. 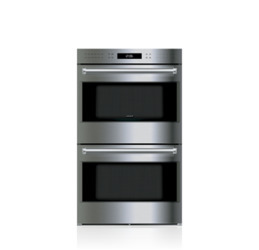 The lower oven is a standard, non-convection offers four modes bake, broil, roast and proof. The series oven controls the setting of the temperature, mode or timer. In between, dual interior lights and a large viewing window help us to keep a tab on cooking progress without having to disturb our dish by opening the door. Other features it includes self-cleaning, timed cook settings, along with one full-extension, easy-glide rack and one full-extension, a door-glide rack that put even the largest and heaviest dishes safely within reach.